Last year, Ford and Lincoln dealers gave back $89 million and 654,240 in volunteer hours to their local communities. We at Shults Ford Lincoln of Wexford are immensely proud to be part of that number, and we are excited to continue our efforts throughout this year as well. 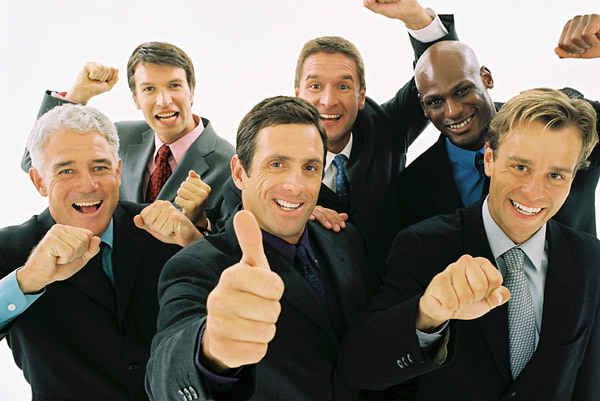 In Ford’s Survey on Dealer Giving, 96 percent of dealerships responded saying they financially supported local causes in 2013, while 86 percent reported staff getting involved in the community in a more personal way by volunteering their time. Shults has had the privilege of supporting various community activities in the past year, including a Christmas tree sale to benefit Junior Achievement programs in schools throughout western Pennsylvania and our Junior Yee Haw visit to the Pittsburgh Children’s Hospital. Speaking of Yee Haws, have you recorded yours lately? We’re in the middle of our Sweet $25,000 Yee Haw Contest. Don’t miss this opportunity to record a special, Shults-of-a-kind “Sweet” Yee Haw before Valentine’s Day and the chance to win $5,000. We’ll also donate $5,000 to charity. We hope to see you soon when you record your sweet Yee Haw; and be sure to stop by and say hello when you see us around town! The reasons the Ford Fiesta ST made it to the top of the list are numerous but simple: it’s easy to park and fill up, it’s affordable, and it packs a hefty amount of horsepower. Despite only sporting a tiny 1.6-liter EcoBoost four-cylinder engine, the performance-tuned Fiesta still manages to achieve 197 horsepower and 202 pound-feet of torque—which means that even with all that power, it’ll still do almost 30 miles per gallon the highway. It’s the perfect combination of fun and economy, especially for the commuters at whom the vehicle is targeted. 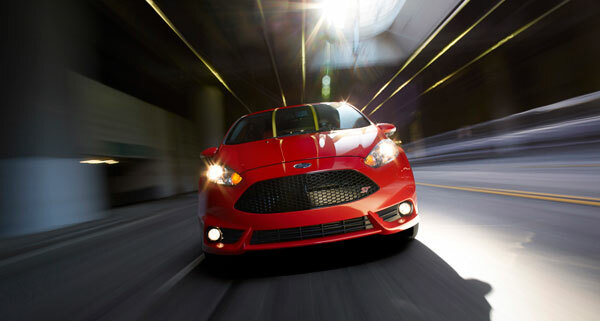 So if you’re one of those commuter looking for a small car that delivers affordability, performance, and efficiency in a single package, just come by Shults Ford of Wexford and get your hands on a Ford Fiesta ST. This January, Shults Ford is highlighting the popular vehicles that have caused so many around the world to switch to a Ford vehicle. As you may have seen on some of Ford’s latest commercials, people who switch to a Ford always wonder why they drove around brand in the first place. Not only are the vehicles reliable, performance features impressive, safety technologies top-of-the-line, but their prices are like no other. Switch to America’s favorite brand today and take advantage of these incredible specials. Pressed for cash after the holiday season? No worries! 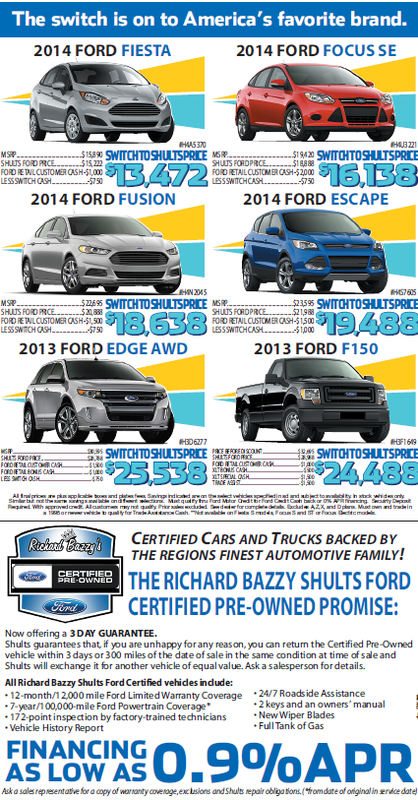 Shults Ford also has an incredibly reliable lineup of used cars featuring The Richard Bazzy Shults Ford Certified Pre-Owned Promise, promising customer their vehicles the best coverage out there. 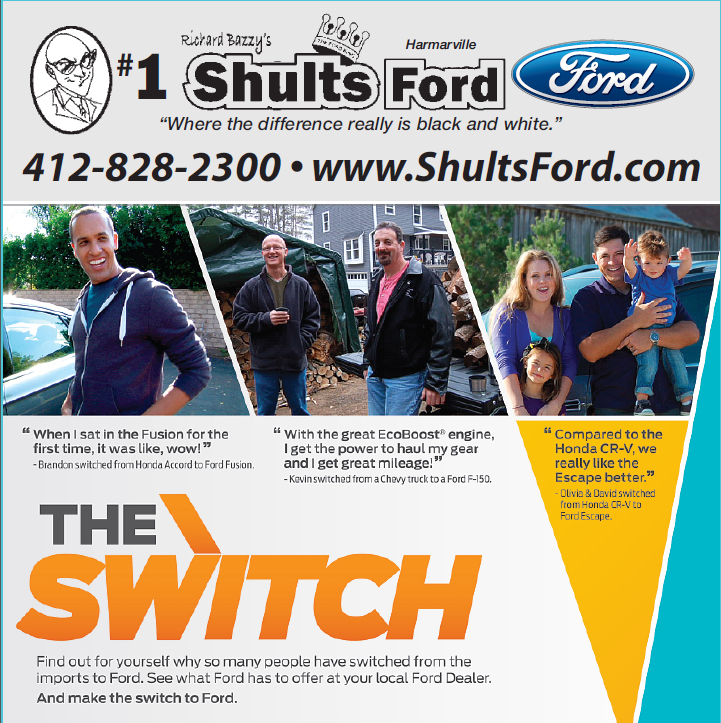 Swing by Shults Ford today and become one of the thousands out there making the switch to a Ford. When you’ve one something four years in a row, it’s usually expected that your winning streak would continue for a fifth. 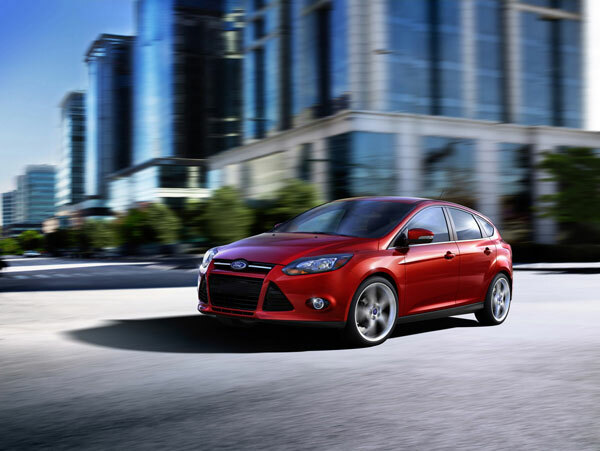 With 2013 retail sales up 15% year-to-date, Ford is once again expecting to keep its best-selling vehicle brand title in the U.S. for the fifth year running. With the lead Ford has over Toyota widening by the second, reaching over 396,041 vehicles through November, there’s not much reason for the American carmaker to feel threatened. Ford is not only the best-selling utility brand, but Ford Escape, Explorer, and hybrid vehicles are all increasing. The all-new Ford C-Max hybrid alone is drawing almost half of its customers from foreign car brands. What do you think of Ford’s chances of being named the best-selling car brand for the fifth year in a row? Share your thoughts below!